Wool / Sillk Twill, 54"
Type: A wonderful introduction to silk painting for wearable art, as well as producing wearbles for fun and profit. 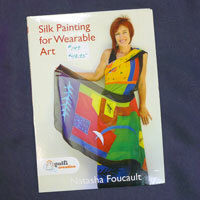 Ideal for all levels of silk painting skill. Four workshops in one: working on small to large frames, producing scarves, ponchos and camisoles. DVD includes 90 minutes of video instruction, 165-page workshop book, and project design templates.